I’ve read several books in the last few years about how we aren’t getting enough minerals in our diets. That’s probably because as a whole we eat more food made in a factory instead of grown on a farm. I remember as a kid the first time my mom bought peanut butter. It tasted great. Only three little ingredients…peanuts, sugar, and oil. We put it on everything from pancakes to sandwiches. Let’s fast forward about 45 years. Today, we have to get raw organic peanut butter to get that same taste because all the ingredients in the conventional brands are made in a factory all except for the GMO peanuts, which are genetically modified to withstand a vat load of pesticides….sorry, that’s another story for another time. What’s so essential about my Essential Seven Mix? Minerals are found here. While nuts are good for a few because of the pesticides and allergies, seeds, on the other hand, are rarely associated with allergies and most are available in their organic forms. Here it is all laid out for you. Mix it all together in a bowl. Grind it in a coffee grinder or food processor till it looks like freshly grown coffee. Store in a mason jar in the fridge. Makes about 3 cups. Serve it in smoothies, (I use 1 Tablespoon in my husband’s wheat grass smoothie every morning) in your oatmeal, tossed into salads, and even as a coating on chicken and fish. If poppy seeds aren’t your thing then opt for raspberry seeds which are also beneficial but more difficult to come by. You can also opt out of the hemp seeds or hearts and add Papaya seeds or Watermelon seeds. Both of which will add a bit of heat to the mix as well. 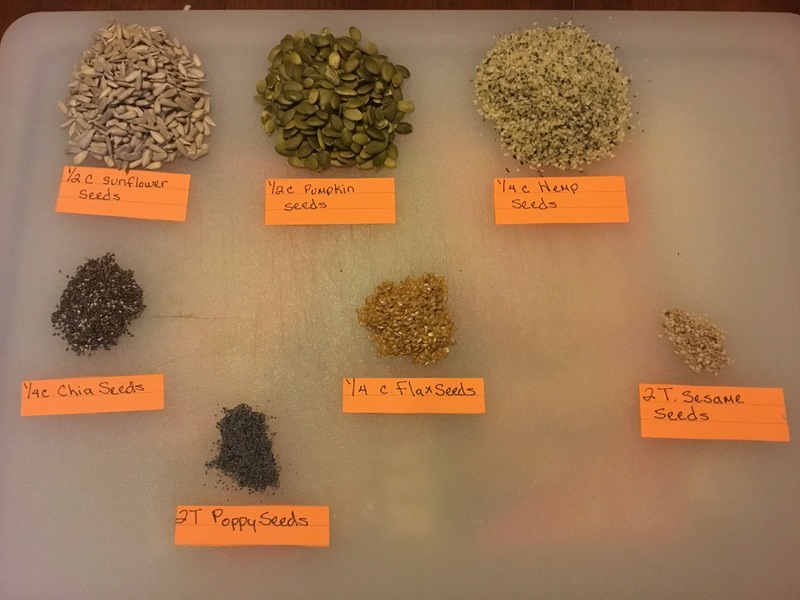 The nutrients each of the following seeds contribute to the overall nutrient makeup of this mix. Obtaining minerals in our diet is so important they are the building blocks of our very existence. This Essential Seven Mix is one of the mainstays of our health. This entry was posted in March 2017, Recipes, Uncategorized and tagged Essential Mix, Life, Minerals, nutrition. Bookmark the permalink.